San Francisco, May 04, 2018 – StratiFi Technologies Inc., whose technology solutions help advisors improve investment outcomes for clients, while increasing the stability of their own businesses, has announced a Series A funding round that was led by Anthemis Group. StratiFi raised $7 million from Anthemis Group, Wolverine Holdings, Cboe Global Markets, HOF Capital and AngelList. Finance and technology industry leaders who also participated, include Mike Curcio, E*Trade’s chief brokerage officer, Matt Hougan, Bitwise Asset Management’s global head of research, and ETF.com’s former chief executive, Matt Wyndowe, formerly Uber’s head of product partnerships and Facebook’s platform games eco-system, and Luke Powell, formerly Prosper’s director of institutional partnerships. StratiFi’s existing investors include Khosla Ventures and Y Combinator. StratiFi’s Series A funds will further commercialize the company’s PRISM Rating™ technology that calculates risk scores for individual investment accounts, and also entire advisory practices. Proceeds also will help build a marketplace of risk solutions, and an educational ecosystem to help advisors and investors better understand risk-adjusted investing. Indeed, risk is increasingly a key concern for investors and advisors who are confronting the realities of underfunded retirement accounts, volatile markets, historically high stock prices, and historically low bond prices. Moreover, the 2017 market year was the least volatile for the Standard & Poor’s 500 Index since 1965. By comparison, the 2018 trading year has been characterized by periods of extraordinary volatility. Sean Park, Anthemis Group’s co-founder, said StratiFi brings risk management technology to advisor desktops. Ed Tilly, Cboe’s chairman and chief executive officer, said technological tools that translate the complexities of the market into solutions anyone can use and understand can benefit investors. 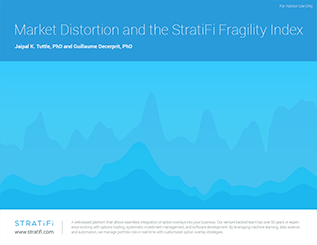 “We expect StratiFi’s offerings will introduce many advisors and investors to strategies that the most sophisticated investors have long relied upon to manage risk and maximize returns,” Tilly said. StratiFi’s PRISM Rating™ technology conducts hundreds of sophisticated calculations to determine if investment portfolios are optimally managing risk and returns. The three-part process begins after an advisor uploads a client’s portfolio into the PRISM platform, which then generates a score of one to 10 that quantifies investment risk. The PRISM scores help investors discover hidden, often misunderstood, risks that can derail their investment goals, and even undermine the stability and growth of an advisor’s practice. PRISM also suggests ways to lower risk and improve returns with risk solutions, while also connecting advisors to a marketplace of approved expert risk management firms. StratiFi’s technology was designed for wealth advisors. The company’s solutions are easy to use so advisors can spend more time growing their practices and educating and helping clients achieve their financial goals. Over time, StratiFi’s technology learns advisor and client preferences through a machine-learning engine to provide increasingly relevant recommendations to optimize investment returns. Advisors can simply connect accounts via their custodial platforms (Schwab, TD Ameritrade, Fidelity, Interactive Brokers, E-Trade, LPL, and others). Traditionally, this critical investment process was considered too complicated for advisors and individual investors. The investment disciplines that StratiFi’s technology has replicated are usually performed by investment teams at major financial institutions. StratiFi has essentially created an “app” that harnesses the institutional investment expertise normally reserved for the world’s wealthiest, most sophisticated investors and made it available to everyone. 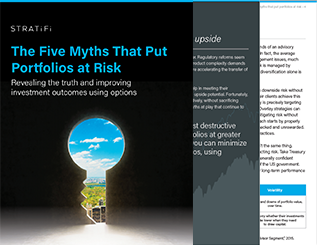 We help investment advisors, family offices and investors define and manage risks that are often hidden, or not well understood, within their client’s portfolios. Our PRISM Rating™ technology democratizes risk management techniques that are normally the purview of sophisticated institutional investors. By identifying, defining, and managing risks, StratiFi helps financial advisors help their clients, and also protect and grow their practices. By educating clients about the realities of markets, advisors can deepen relationships, and better help investors confront the challenges of modern markets and the demands of modern life. Anthemis cultivates change in financial services by building, growing, and sustaining businesses committed to improving the world. Our deep understanding of markets and models, passion for emerging technology and spirit of collaboration inspire everything we do. By creating fertile ground for entrepreneurs, institutions, researchers, academics, and visionaries to come together, we believe we can solve the financial services world’s most pressing challenges faster, better and for the benefit of all. For more information, visit www.cboe.com.